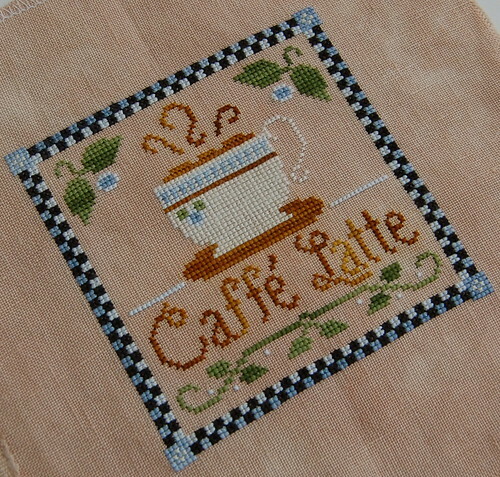 Nicole's Needlework: Caffe Latte Finished! I finally got Caffe Latte finished up today! Little House Needleworks "Caffe Latte"
Caffe Latte is really pretty and it goes really well with Frappucino too!! They are just really pretty!! Gorgeous! I love, Love, LOVE it!!! It looks wonderful! Now I want to stitch the whole set for my kitchen. Beautiful! Congrats on another finish! Your needlepoint is so nice. I will be coming soon to see your wonderful needlepoint. Nice finish, Congrats :) You are a very quick stitcher! Did you increase the number of strands of silk called for in the original instructions? If so, was there enough silk included or did you have to purchase more? I am working on Herbal Tea, and the thread coverage is rather sparse compared to the full look that you have achieved. Very nice work. I ordered the suggested frames for finishing. How will you finish yours? Beautiful as always Nicole! Congrats. Beautiful finish, looks yummy. Love that fabric too! How was the photography class btw? I love looking at your pictures. That's so pretty and the fabric is lovely too! Now I'm craving for some caffeine. Caffe Latte looks brilliant Nicole!